Landaas & Company newsletter January edition now available. Led by a rebound in utilities, industrial production increased in December. The Federal Reserve reported a 6.6% rise in utilities output from November, the biggest gain since 1989, after seasonal weather returned following an extraordinarily warm month in much of the nation. Manufacturing production rose for the third time in four months, despite the strong dollar and weak global growth. Capacity utilization rose to 75.5%, the highest since August, and still down from the 44-year average of 80%. That suggests that inflation is not imminent. The broadest measure of inflation moved up in December. The Consumer Price Index nudged up 0.3% from November, largely because of higher gas prices, the Bureau of Labor Statistics reported. Excluding volatile energy and food prices, core inflation rose 2.2% from December 2015, which is around the rate targeted by the Fed. Year-to-year inflation rates included 9% for gasoline, 3.9% for medical services, 3.6% for shelter and a negative 3.5% for used vehicles. The Fed’s Beige Book of anecdotal economic observations shows continued modest expansion across most of the Fed’s 12 districts. The report, covering late November through the end of 2016, cited increased manufacturing sales, mixed activity in the energy industry, growing retail sales, tighter labor markets and optimism about 2017. The pace at which Americans started building houses rose in December, suggesting the long and ragged housing recovery is still on. According to the Department of Commerce, housing starts were on a 1.2 million unit annual pace, up 11.3% from November and up 5.7% from December 2015. 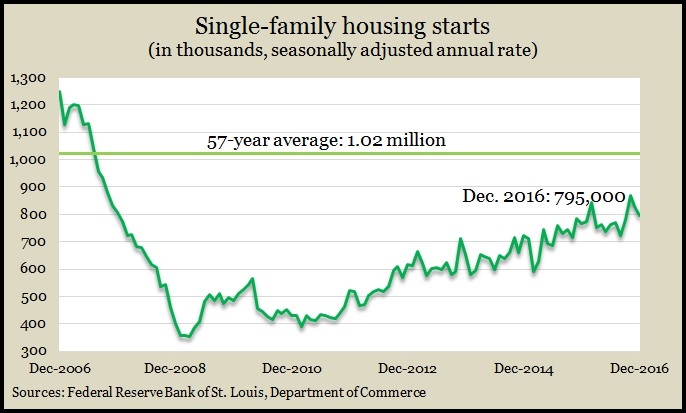 New construction of single-family residences dropped but remained about where it was before the recession. The same report showed a slight decline in the rate of building permits for housing overall, but single-family permits rose for the fifth month in a row. The moving four-week average for initial unemployment claims fell to the lowest level since November 1973, a persistent sign that employers are reluctant to let go of their workers. The average dropped for the fourth week in a row and has remained below the 49-year average each week for more than four years, according to Labor Department data.